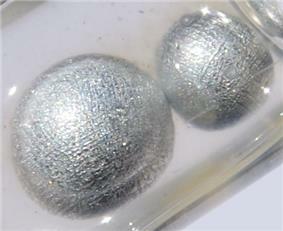 Potassium pearls under paraffin oil. The large pearl measures 0.5 cm. Potassium is a chemical element with symbol K (derived from Neo-Latin kalium) and atomic number 19. Elemental potassium is a soft silvery-white alkali metal that oxidizes rapidly in air and is very reactive with water, generating sufficient heat to ignite the hydrogen emitted in the reaction and burning with a lilac flame. 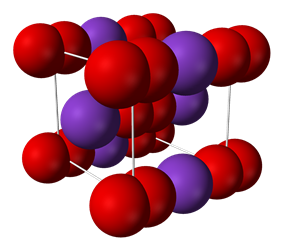 Naturally occurring potassium is composed of three isotopes, one of which, 40K, is radioactive. Traces (0.012%) of this isotope are found in all potassium, making 40K the most common radioisotope in the human body and in many biological materials, as well as in common building substances such as concrete. Because potassium and sodium are chemically very similar, their salts were not at first differentiated. The existence of multiple elements in their salts was suspected in 1702, and this was proven in 1807 when potassium and sodium were individually isolated from different salts by electrolysis. 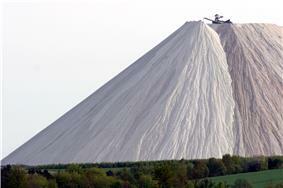 Potassium in nature occurs only in ionic salts. As such, it is found dissolved in seawater (which is 0.04% potassium by weight), and is part of many minerals. Potassium ions are necessary for the function of all living cells. Potassium ion diffusion is a key mechanism in nerve transmission, and potassium depletion in animals, including humans, results in various cardiac dysfunctions. Potassium accumulates in plant cells, and thus fresh fruits and vegetables are a good dietary source of it. This resulted in potassium first being isolated from potash, the ashes of plants, giving the element its name. For the same reason, heavy crop production rapidly depletes soils of potassium, and agricultural fertilizers consume 95% of global potassium chemical production. Conversely, plants are intolerant of sodium ions and thus sodium is present in only low concentrations, except specialist halophytes. Potassium atoms have 19 electrons, which is one more than the extremely stable configuration of the noble gas argon. Because of this and its low first ionization energy of 418.8 kJ/mol, the potassium atom is thus much more likely to lose the "extra" electron, acquiring a positive charge, than to gain one and acquire a negative charge; however, such negatively charged alkalide ions (K–) are known. This process requires so little energy that potassium is readily oxidized by atmospheric oxygen. In contrast, the second ionization energy is very high (3052 kJ/mol), because removal of two electrons breaks the stable noble gas electronic configuration (the configuration of the inert argon). Potassium therefore does not readily form compounds with the oxidation state of +2 or higher. Potassium is an extremely active metal, which reacts violently with oxygen and water in air. With oxygen it forms potassium peroxide, and with water potassium forms potassium hydroxide. The reaction of potassium with water is dangerous because of its violent exothermic character and the production of hydrogen gas. Hydrogen reacts again with atmospheric oxygen, producing water, which reacts with the remaining potassium. This reaction requires only traces of water; because of this, potassium and its liquid alloy with sodium — NaK — are potent desiccants that can be used to dry solvents prior to distillation. All alkali metals are similar in this respect: see Zeeman effect for more information. 2). The last two species, especially the superoxide, are rare and are formed only in reaction with very electropositive metals; these species contain oxygen-oxygen bonds. All potassium-oxygen binary compounds are known to react with water violently, forming potassium hydroxide. This compound is a very strong alkali, and 1.21 kg of it can dissolve in as little as a liter of water. Potassium compounds are typically highly ionic and thus most of them are soluble in water. The main species in water are the aquated complexes [K(H2O)n]+ where n = 6 and 7. Some of the few poorly soluble potassium salts include potassium tetraphenylborate, potassium hexachloroplatinate, and potassium cobaltinitrite. 40K occurs in natural potassium (and thus in some commercial salt substitutes) in sufficient quantity that large bags of those substitutes can be used as a radioactive source for classroom demonstrations. 40K is the radioisotope with the largest abundance in the body. In healthy animals and people, 40K represents the largest source of radioactivity, greater even than 14C. In a human body of 70 kg mass, about 4,400 nuclei of 40K decay per second. The activity of natural potassium is 31 Bq/g. See also the categories Potassium minerals and Potassium compounds. Potassium is formed in the universe by nucleosynthesis from lighter atoms. Potassium is principally created in Type II supernovas via the explosive oxygen-burning process. 40K is also formed in s-process nucleosynthesis and the neon burning process. Elemental potassium does not occur in nature because of its high reactivity. It reacts violently with water (see section Precautions below) and also reacts with oxygen. In its various compounds, potassium makes up about 2.6% of the weight of the Earth's crust and is the seventh most abundant element, similar in abundance to sodium at approximately 1.8% of the crust. It is the 17th most abundant element by weight in the entire planet and 20th most abundant in the Solar System. The potassium concentration in seawater is 0.39 g/L (0.039 wt/v%), far less abundant than sodium at 10.8 g/L (1.08 wt/v%). Neither elemental potassium nor potassium salts (as separate entities from other salts) were known in Roman times, and the Latin name of the element, kalium, is not Classical Latin but rather neo-Latin. Kalium was taken from the word "alkali", which in turn came from Arabic: القَلْيَه‎ al-qalyah "plant ashes." The similar-sounding English term alkali is from this same root, whereas the word for potassium in Modern Standard Arabic is بوتاسيوم būtāsyūm. The English name for the element potassium comes from the word " and Henri Louis Duhamel du Monceau was able to prove this difference in 1736. The exact chemical composition of potassium and sodium compounds, and the status as chemical element of potassium and sodium, was not known then, and thus Antoine Lavoisier did not include the alkali in his list of chemical elements in 1789. 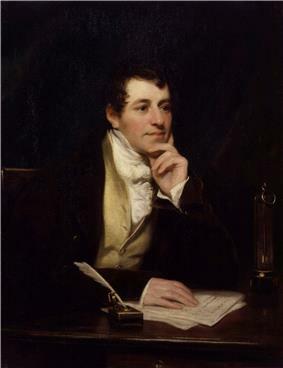 Potassium metal was first isolated in 1807 in England by Sir Humphry Davy, who derived it from caustic potash (KOH, potassium hydroxide) by the use of electrolysis of the molten salt with the newly discovered voltaic pile. Potassium was the first metal that was isolated by electrolysis. Later in the same year, Davy reported extraction of the metal sodium from a mineral derivative (caustic soda, NaOH, or lye) rather than a plant salt, by a similar technique, demonstrating that the elements, and thus the salts, are different. Although the production of potassium and sodium metal should have shown that both are elements, it took some time before this view was universally accepted. For a long time the only significant applications for potash were the production of glass, bleach, soap and gunpowder as potassium nitrate. Potassium soaps from animal fats and vegetable oils were especially prized, as they tended to be more water-soluble and of softer texture, and were known as soft soaps. The discovery by Justus Liebig in 1840 that potassium is a necessary element for plants and that most types of soil lack potassium caused a steep rise in demand for potassium salts. Wood-ash from fir trees was initially used as a potassium salt source for fertilizer, but, with the discovery in 1868 of mineral deposits containing potassium chloride near Staßfurt, Germany, the production of potassium-containing fertilizers began at an industrial scale. Other potash deposits were discovered, and by the 1960s Canada became the dominant producer. 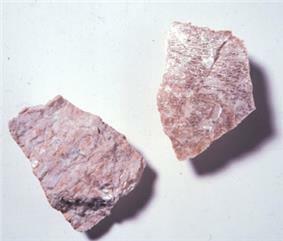 Potassium salts such as carnallite, langbeinite, polyhalite, and sylvite form extensive deposits in ancient lake bottoms and seabeds, making extraction of potassium salts in these environments commercially viable. The principal source of potassium – potash – is mined in Canada, Russia, Belarus, Germany, Israel, United States, Jordan, and other places around the world. The first mined deposits were located near Staßfurt, Germany, but the deposits span from Great Britain over Germany into Poland. They are located in the Zechstein and were deposited in the Middle to Late Permian. The largest deposits ever found lie 1,000 meters (3,300 feet) below the surface of the Canadian province of Saskatchewan. The deposits are located in the Elk Point Group produced in the Middle Devonian. Saskatchewan, where several large mines have operated since the 1960s, pioneered the use of freezing of wet sands (the Blairmore formation) in order to drive mine shafts through them. The main potash mining company in Saskatchewan is the Potash Corporation of Saskatchewan. The water of the Dead Sea is used by Israel and Jordan as a source for potash, while the concentration in normal oceans is too low for commercial production at current prices. Potassium is an essential macromineral in human nutrition; it is the major cation (positive ion) inside animal cells, and it is thus important in maintaining fluid and electrolyte balance in the body. Sodium makes up most of the cations of blood plasma at a reference range of about 145 mmol/L (3.345 g)(1 mmol/L = 1mEq/L), and potassium makes up most of the cell fluid cations at about 150 mmol/L (4.8 g). Plasma is filtered through the glomerulus of the kidneys in enormous amounts, about 180 liters per day. Thus 602 g of sodium and 33 g of potassium are filtered each day. All but the 1–10 g of sodium and the 1–4 g of potassium likely to be in the diet must be reabsorbed. Sodium must be reabsorbed in such a way as to keep the blood volume exactly right and the osmotic pressure correct; potassium must be reabsorbed in such a way as to keep serum concentration as close as possible to 4.8 mmol/L (about 0.190 g/L). Sodium pumps in the kidneys must always operate to conserve sodium. Potassium must sometimes be conserved also, but, as the amount of potassium in the blood plasma is very small and the pool of potassium in the cells is about thirty times as large, the situation is not so critical for potassium. Since potassium is moved passively in counter flow to sodium in response to an apparent (but not actual) Donnan equilibrium, the urine can never sink below the concentration of potassium in serum except sometimes by actively excreting water at the end of the processing. Potassium is secreted twice and reabsorbed three times before the urine reaches the collecting tubules. At that point, it usually has about the same potassium concentration as plasma. At the end of the processing, potassium is secreted one more time if the serum levels are too high. A potassium intake sufficient to support life can in general be guaranteed by eating a variety of foods. Foods rich in potassium include yam, parsley, dried apricots, dried milk, chocolate, various nuts (especially almonds and pistachios), potatoes, bamboo shoots, bananas, avocados, soybeans, and bran, although it is also present in sufficient quantities in most fruits, vegetables, meat and fish. Epidemiological studies and studies in animals subject to hypertension indicate that diets high in potassium can reduce the risk of hypertension and possibly stroke (by a mechanism independent of blood pressure), and a potassium deficiency combined with an inadequate thiamine intake has produced heart disease in rats. There is some debate regarding the optimal amount of dietary potassium. For example, the 2004 guidelines of the Institute of Medicine specify a DRI of 4,700 mg of potassium (100 mEq), though most Americans consume only half that amount per day, which would make them formally deficient as regards this particular recommendation. Likewise, in the European Union, in particular in Germany and Italy, insufficient potassium intake is somewhat common. Italian researchers reported in a 2011 meta-analysis that a 1.64 g higher daily intake of potassium was associated with a 21% lower risk of stroke. 2O. Modern high-yield agriculture depends upon fertilizers to replace the potassium lost at harvest. Most agricultural fertilizers contain potassium chloride, while potassium sulfate is used for chloride-sensitive crops or crops needing higher sulfur content. The sulfate is produced mostly by decomposition of the complex minerals kainite (MgSO4·KCl·3H2O) and langbeinite (MgSO4·K2SO4). Only a very few fertilizers contain potassium nitrate. In 2005, about 93% of world potassium production was consumed by the fertilizer industry. The potassium cation is a nutrient necessary for human life and health. Potassium chloride is used as a substitute for table salt by those seeking to reduce sodium intake so as to control hypertension. The USDA lists tomato paste, orange juice, beet greens, white beans, potatoes, bananas and many other dietary sources of potassium, ranked in descending order according to potassium content. 3) is used as a food preservative, for example in wine and beer-making (but not in meats). It is also used to bleach textiles and straw, and in the tanning of leathers. 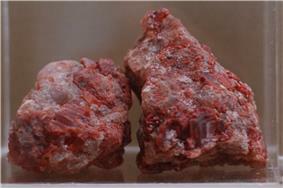 3 or potash) is used in the manufacture of glass, soap, color TV tubes, fluorescent lamps, textile dyes and pigments. Potassium permanganate (KMnO4) is an oxidizing, bleaching and purification substance and is used for production of saccharin. 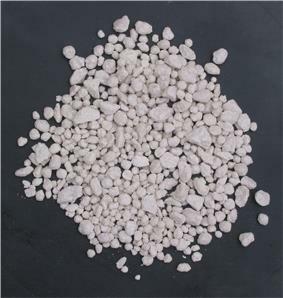 Potassium chlorate (KClO3) is added to matches and explosives. Potassium bromide (KBr) was formerly used as a sedative and in photography. ^ Haynes, William M., ed. (2011). ^ a b Webb, D. A. (April 1939). "The Sodium and Potassium Content of Sea Water". ^ Anthoni, J. (2006). "Detailed composition of seawater at 3.5% salinity". seafriends.org.nz. Retrieved 2011-09-23. ^ a b c Dye, J. L. (1979). "Compounds of Alkali Metal Anions". ^ a b James, A. M.; Lord, M. P. (1992). Macmillan's chemical and physical data. London: Macmillan. ^ a b c d Holleman, Arnold F.; Wiberg, Egon; Wiberg, Nils (1985). "Potassium". Lehrbuch der Anorganischen Chemie (in German) (91–100 ed.). Walter de Gruyter. ^ Rieke, R. D. (1989). "Preparation of Organometallic Compounds from Highly Reactive Metal Powders". ^ Lide, David R. (1998). Handbook of Chemistry and Physics (87 ed.). Boca Raton, Florida, United States: CRC Press. pp. 477; 520. ^ Lide, D. R., ed. (2005). CRC Handbook of Chemistry and Physics (86th ed.). Boca Raton (FL): CRC Press. p. 4–80. ^ Lincoln, S. F.; Richens, D. T. and Sykes, A. G. "Metal Aqua Ions" in J. A. McCleverty and T. J. Meyer (eds.) Comprehensive Coordination Chemistry II, Vol. 1, pp. 515–555, ISBN 978-0-08-043748-4. ^ a b Georges, Audi; Bersillon, O.; Blachot, J.; Wapstra, A.H. (2003). "The NUBASE Evaluation of Nuclear and Decay Properties". Nuclear Physics A (Atomic Mass Data Center) 729: 3–128. ^ Bowen, Robert; Attendorn, H. G. (1988). "Theory and Assumptions in Potassium–Argon Dating". Isotopes in the Earth Sciences. Springer. pp. 203–208. ^ Anaç, D. and Martin-Prével, P. (1999). Improved crop quality by nutrient management. Springer. pp. 290–. ^ Shimansky, V.; Bikmaev, I. F.; Galeev, A. I.; Shimanskaya, N. N.; Ivanova, D. V.; Sakhibullin, N. A.; Musaev, F. A.; Galazutdinov, G. A. (September 2003). "Observational constraints on potassium synthesis during the formation of stars of the Galactic disk". Astronomy Reports 47 (9): 750. ^ a b Micale, Giorgio; Cipollina, Andrea; Rizzuti, Lucio (2009). Seawater Desalination: Conventional and Renewable Energy Processes. Springer. p. 3. ^ a b c d Prud'homme, Michel; Krukowski, Stanley T. (2006). "Potash". Industrial minerals & rocks: commodities, markets, and uses. Society for Mining, Metallurgy, and Exploration. pp. 723–740. ^ Davy, Humphry (1808). "On some new phenomena of chemical changes produced by electricity, in particular the decomposition of the fixed alkalies, and the exhibition of the new substances that constitute their bases; and on the general nature of alkaline bodies". Philosophical Transactions of the Royal Society 98: 32. ^ du Monceau, H. L. D. (1702–1797). "Sur la Base de Sel Marine". Memoires de l'Academie royale des Sciences (in French): 65–68. ^ a b c Siegfried, R. (1963). "The Discovery of Potassium and Sodium, and the Problem of the Chemical Elements". Isis 54 (2): 247–258. ^ Enghag, P. (2004). "11. Sodium and Potassium". Encyclopedia of the elements. Wiley-VCH Weinheim. ^ Davy, Humphry (1808). "On some new phenomena of chemical changes produced by electricity, in particular the decomposition of the fixed alkalies, and the exhibition of the new substances that constitute their bases; and on the general nature of alkaline bodies". Philosophical Transactions of the Royal Society 98: 1–44. ^ Shaposhnik, V. A. (2007). "History of the discovery of potassium and sodium (on the 200th anniversary of the discovery of potassium and sodium)". Journal of Analytical Chemistry 62 (11): 1100–1102. ^ Browne, C. A. (1926). "Historical notes upon the domestic potash industry in early colonial and later times". Journal of Chemical Education 3 (7): 749–756. ^ Cordel, Oskar (1868). Die Stassfurter Kalisalze in der Landwirthschalt: Eine Besprechung ... (in German). L. Schnock. ^ United Nations Industrial Development Organization and Int'l Fertilizer Development Center (1998). Fertilizer Manual. pp. 46, 417. ^ Miller, H. (1980). "Potash from Wood Ashes: Frontier Technology in Canada and the United States". Technology and Culture 21 (2): 187–208. ^ Rittenhouse, P. A. (1979). "Potash and politics". Economic Geology 74 (2): 353–357. ^ Garrett, Donald E. (1995-12-31). Potash: deposits, processing, properties and uses. Springer. ^ Wishart, David J (2004). Encyclopedia of the Great Plains. U of Nebraska Press. p. 433. ^ Chiu, Kuen-Wai (2000). Kirk-Othmer Encyclopedia of Chemical Technology. John Wiley & Sons, Inc.
^ Delahunt, J; Lindeman, T (2007). "Review of the safety of potassium and potassium oxides, including deactivation by introduction into water". Journal of Chemical Health and Safety 14 (2): 21–32. ^ Abdel-Wahab, M.; Youssef, S.; Aly, A.; el-Fiki, S.; el-Enany, N.; Abbas, M. (1992). "A simple calibration of a whole-body counter for the measurement of total body potassium in humans". International Journal of Radiation Applications and Instrumentation. Part A. Applied Radiation and Isotopes 43 (10): 1285–1289. ^ Chang, Raymond (2007). Chemistry. McGraw-Hill Higher Education. p. 52. ^ Campbell, Neil (1987). Biology. Menlo Park, California: Benjamin/Cummings Pub. Co. p. 795. ^ Hellgren, Mikko; Sandberg, Lars; Edholm, Olle (2006). "A comparison between two prokaryotic potassium channels (KirBac1.1 and KcsA) in a molecular dynamics (MD) simulation study". Biophysical Chemistry 120 (1): 1–9. ^ a b Institute of Medicine (U.S.). Committee on Optimization of Nutrient Composition of Military Rations for Short-Term, High-Stress Situations; Institute of Medicine (U.S.). Committee on Military Nutrition Research (2006). Nutrient composition of rations for short-term, high-intensity combat operations. National Academies Press. pp. 287–. ^ Shallenberger, R. S. (1993). Taste chemistry. Springer. pp. 120–. ^ Lockless, S. W.; Zhou, M.; MacKinnon, R. (2007). "Structural and thermodynamic properties of selective ion binding in a K+ channel". PLoS Biol 5 (5): e121. ^ Slonim, Anthony D.; Pollack, Murray M. (2006). "Potassium". Pediatric critical care medicine. Lippincott Williams & Wilkins. p. 812. ^ Visveswaran, Kasi (2009). "hypokalemia". Essentials of Nephrology (2nd ed.). BI Publications. p. 257. ^ Potts, W. T. W.; Parry, G. (1964). Osmotic and ionic regulation in animals. ^ Lans, H. S.; Stein, I. F.; Meyer, KA (1952). "The relation of serum potassium to erythrocyte potassium in normal subjects and patients with potassium deficiency". American Journal of Medical Science 223 (1): 65–74. ^ Bennett, C. M.; Brenner, B. M.; Berliner, R. W. (1968). "Micropuncture study of nephron function in the rhesus monkey". Journal of Clinical Investigation 47 (1): 203–216. ^ Solomon, A. K. (1962). "Pumps in the living cell". Scientific American 207 (2): 100–8. ^ Wright, F. S. (1977). "Sites and mechanisms of potassium transport along the renal tubule". Kidney International 11 (6): 415–432. ^ Squires, R. D.; Huth, E. J. (1959). "Experimental potassium depletion in normal human subjects. I. Relation of ionic intakes to the renal conservation of potassium". Journal of Clinical Investigation 38 (7): 1134–1148. ^ Fiebach, Nicholas H.; Barker, Lee Randol; Burton, John Russell and Zieve, Philip D. (2007). Principles of ambulatory medicine. Lippincott Williams & Wilkins. pp. 748–750. ^ Gadsby, D. C. (2004). "Ion transport: spot the difference". Nature 427 (6977): 795–797. ^ Jiang, Y.; Lee, A.; Chen, J.; Cadene, M.; Chait, B. T.; MacKinnon, R. (2002). "Crystal structure and mechanism of a calcium-gated potassium channel". Nature 417 (6888): 515–22. ^ Shi, N.; Ye, S.; Alam, A.; Chen, L.; Jiang, Y (2006). "Atomic structure of a Na+- and K+-conducting channel". Nature 440 (7083): 570–574. ; includes a detailed picture of atoms in the pump. ^ Zhou, Y.; Morais-Cabral, J. H.; Kaufman, A.; MacKinnon, R. (2001). "Chemistry of ion coordination and hydration revealed by a K+ channel-Fab complex at 2.0 A resolution". Nature 414 (6859): 43–48. ^ Noskov, S. Y.; Bernèche, S.; Roux, B. (2004). "Control of ion selectivity in potassium channels by electrostatic and dynamic properties of carbonyl ligands". Nature 431 (7010): 830–834. ^ Panel on Dietary Reference Intakes for Electrolytes and Water, Standing Committee on the Scientific Evaluation of Dietary Reference Intakes, Food and Nutrition (2005). DRI, dietary reference intakes for water, potassium, sodium, chloride, and sulfate. Washington, D.C.: National Academies Press. ^ Grim, C. E.; Luft, F. C.; Miller, J. Z.; Meneely, G.R. ; Battarbee, H. D.; Hames, C. G.; Dahl, L. K. (1980). "Racial differences in blood pressure in Evans County, Georgia: relationship to sodium and potassium intake and plasma renin activity". Journal of Chronicle Diseases 33 (2): 87–94. ^ Karger, S. (2004). "Energy and nutrient intake in the European Union". Annals of Nutrition and Metabolism 48 (2 (suppl)): 1–16. ^ D'Elia, L.; Barba, G.; Cappuccio, F.; Strazzullo, P. (2011). "Potassium Intake, Stroke, and Cardiovascular Disease: A Meta-Analysis of Prospective Studies". The Journal of the American College of Cardiology 57 (10): 1210–1219. ^ Pohl, Hanna R.; Wheeler, John S.; Murray, H. Edward (2013). "Chapter 2. Sodium and Potassium in Health and Disease". In Astrid Sigel, Helmut Sigel and Roland K. O. Sigel. Interrelations between Essential Metal Ions and Human Diseases. Metal Ions in Life Sciences 13. Springer. pp. 29–47. ^ Roy, Amit H. (2007). Kent and Riegel's handbook of industrial chemistry and biotechnology. Springer. pp. 1135–1157. ^ Figoni, Paula I (2010). "Bleaching and Maturing Agents". How Baking Works: Exploring the Fundamentals of Baking Science. John Wiley and Sons. p. 86. ^ Chichester, C. O. (July 1986). "Uses and Exposure to Sulfites in Food". Advances in food research. Academic Press. pp. 4–6. ^ Toedt, John; Koza, Darrell and Cleef-Toedt, Kathleen Van (2005). "Personal Cleansing Products: Bar Soap". Chemical composition of everyday products. Greenwood Publishing Group. ^ Siegel, Richard S. (1940). "Ignition of the safety match". Journal of Chemical Education 17 (11): 515. ^ Marx, Robert F. (1990). The history of underwater exploration. Courier Dover Publications. p. 93. ^ Gettens, Rutherford John and Stout, George Leslie (1966). Painting materials: A short encyclopaedia. Courier Dover Publications. pp. 109–110. ^ Jackson, C. B.; Werner, R. C. (1957). "Handling and uses of the alkali metals". Advances in Chemistry. Advances in Chemistry 19: 169–173. ^ Kearey, Philip; Brooks, M and Hill, Ian (2002). "Optical Pumped Magnetometer". An introduction to geophysical exploration. Wiley-Blackwell. p. 164. ^ Solomon, Robert E. (2002). Fire and Life Safety Inspection Manual. Jones & Bartlett Learning. p. 459. ^ a b Schonwald, Seth (2004). "Potassium Chloride and Potassium Permanganate". Medical toxicology. Lippincott Williams & Wilkins. pp. 903–905. ^ Markovchick, Vincent J. and Pons, Peter T. (2003). Emergency medicine secrets. Elsevier Health Sciences. p. 223. Burkhardt, Elizabeth R. et al. (2006). "Potassium and Potassium Alloys". Ullmann's Encyclopedia of Industrial Chemistry A22. pp. 31–38. Greenwood, Norman N; Earnshaw, Alan (1997). Chemistry of the Elements (2 ed.). Oxford: Butterworth-Heinemann. Holleman, Arnold F.; Wiberg, Egon; Wiberg, Nils (2007). "Potassium". Lehrbuch der Anorganischen Chemie (in German) (91–100 ed.). Walter de Gruyter. Schultz, H. et al. (2006). "Potassium compounds". Ullmann's Encyclopedia of Industrial Chemistry A22. pp. 39–103.